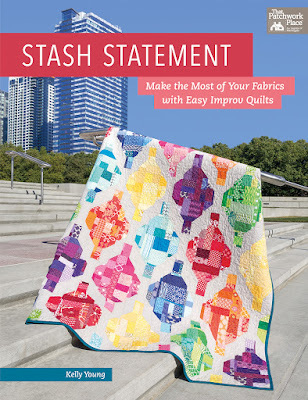 Have you seen Stash Statement, the new book by My Quilt Infatuation's Kelly Young? 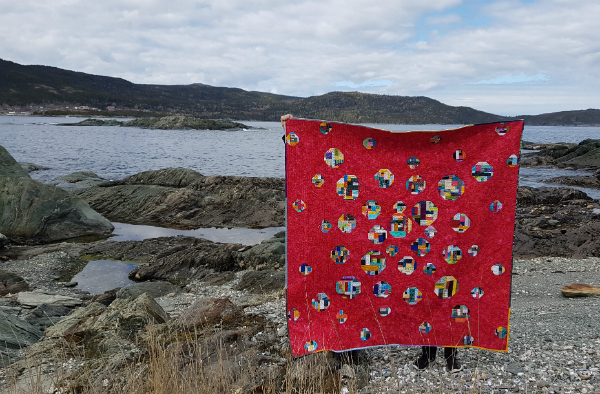 The book is absolutely beautiful and I was honoured when Kelly asked if I'd be part of the blog hop to introduce each of the quilts. I chose to make Murrina, after being assured by Kelly that it is much easier to make than it looks. Thankfully, she was right! 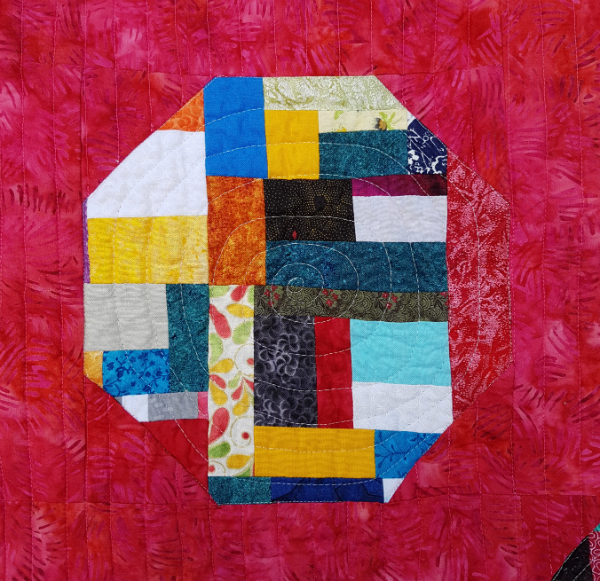 All of the quilts in the book are made by sewing scraps together to make large improv panels that are then cut to the sizes needed. 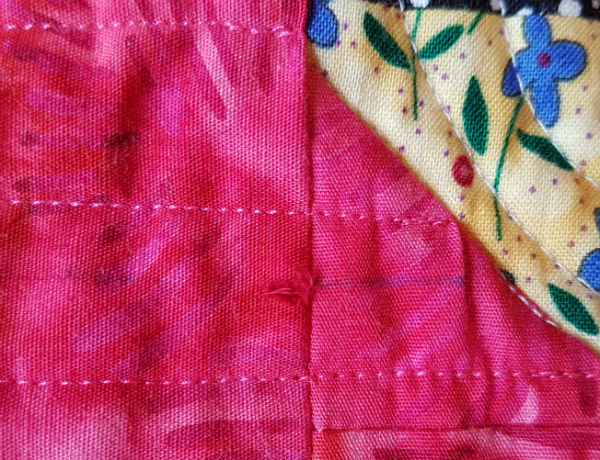 You can read my thoughts on sewing the scraps together here. The short version? 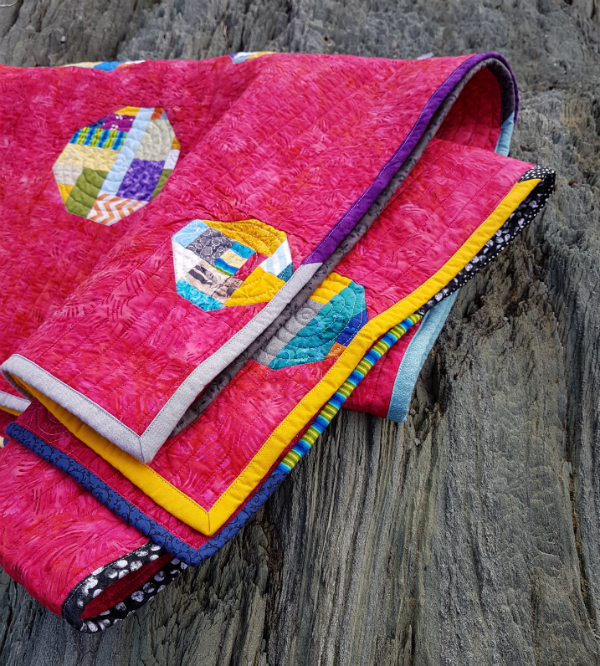 I really enjoyed the process and I'm looking forward to doing it again, especially since my scrap bag is still full and there are other quilts in the book that I want to make. With all the negative space in this design, I knew it would be a great place to highlight a beautiful batik and I'm so glad the people at Island Batik agreed to send me all of this loveliness. I debated whether or not to share the story behind this fabric choice since it makes me look foolish, but in the interests of keeping it real, here goes...When Katie at Island Batik agreed to sponsor the background and backing, she asked which fabric I wanted and I immediately sent her the SKU number for a gorgeous blue. A few days later I wanted to check something about the fabric, which is when I realized I had sent her the WRONG NUMBER! 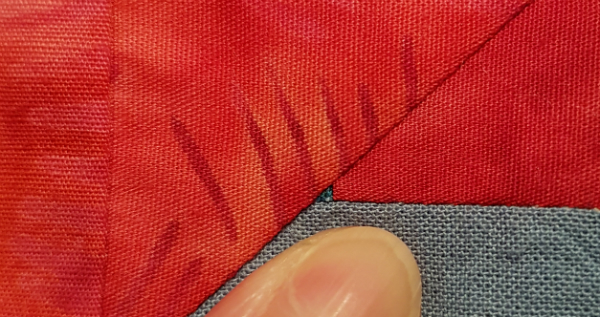 I was looking at thumbnail pictures of the fabrics and I had copied the number below the picture when I should have taken the number above it. Insert forehead smacking emoji here. After a few moments of staring at my computer in disbelief, I ran to my stash and pulled out a length of pink and threw some of my scrappy blocks on it to see if they'd work with what I had accidentally requested. To my relief, it did work. Phew. Even better, I loved the fabric when it arrived! And, since I had made my scrappy blocks with no plan for what I would use as the background, there are a lot of blue scraps in them. That might have made the blocks a little less distinct, as you can see happens when some reds or pinks are at the edge of the blocks. With some Warm and Natural batting and Aurifil thread (2600 for the blocks and 2530 for the background), it was time to get quilting. 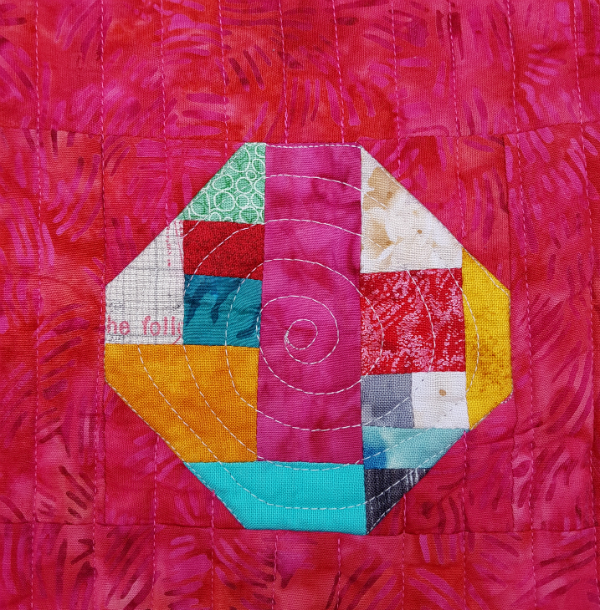 I quilted around the edge of each snowball block and then worked my way in to the center in a spiral. These small snowball blocks were satisfyingly fast to quilt! I already wrote about quilting those straight lines, so I won't say much about that here. I will say that a few people suggested that lowering the pressure on my presser foot would help with the pleats, but unfortunately that isn't an option on my machine. I guess I'll just have to be more careful as I plan my quilting in the future. I have no idea how it happened, though it looks like it was either the water erasable pen I was using to mark registration lines, or the edge of the ruler I was using to keep them straight, since it is exactly on the drawn line. Neither makes sense, though. I have felt all along the ruler and can't find any sharp spots and the pen has a soft tip, so I can't see it tearing the fabric. 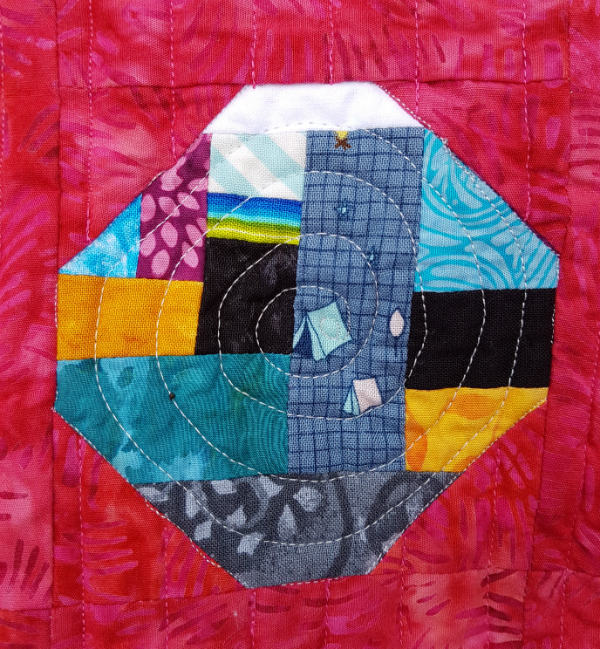 A few deep breaths later, I kept quilting while I pondered how I would fix the problem. Eventually, I decided to cut a heart out of the background fabric and glue it over the tear. 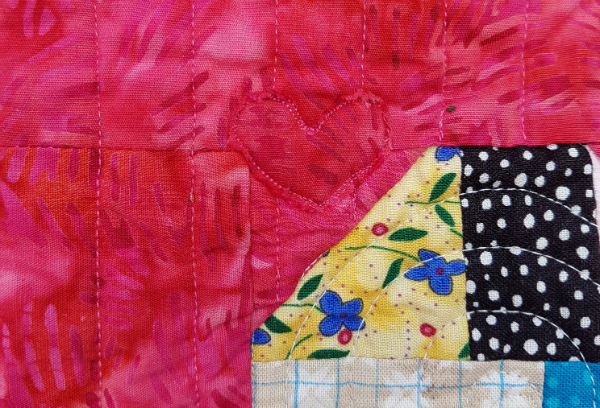 I used the pen to outline the edge of the heart so that I could see it and then I stitched twice around the edge. Here's how it looks after the pen marks were washed away. A scrappy binding seemed the perfect way to finish this quilt, so I pulled out my bag of leftover binding pieces and joined them together. I left out any red or pink pieces, so the binding wouldn't disappear into the background, but anything else was fair game. I purposely didn't join two pieces that were the same colour, just to keep it looking really scrappy. And then, when I stitched it to the quilt, the ending piece and the starting piece were both black with white dots! Go figure. I (very briefly) considered cutting the last piece off and adding in another fabric, but that seemed like too much work when I was so close to finishing, so the two black and whites meet. Oh well! 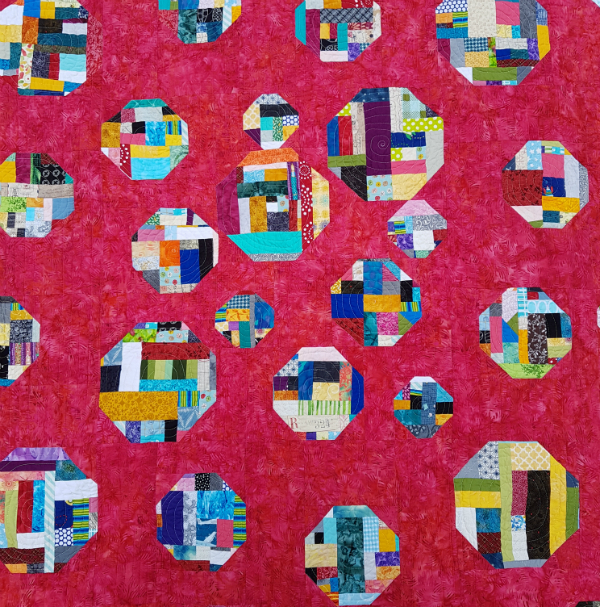 Yvonne, at Quilting Jetgirl, has also made a version of the Murrina quilt, so be sure to check that out. Her quilt and mine are nothing alike (judging from her progress pictures) so I can't wait to see it! Are you subscribed for The Bulletin, my monthly newsletter? If you are, you should have received an email last week asking for your consent to continue receiving emails from me. It's important that you update your subscriber settings to indicate that consent because going forward I will only be sending the Bulletin to those who have consented (because of the new GDPR regulation that has just gone into effect). 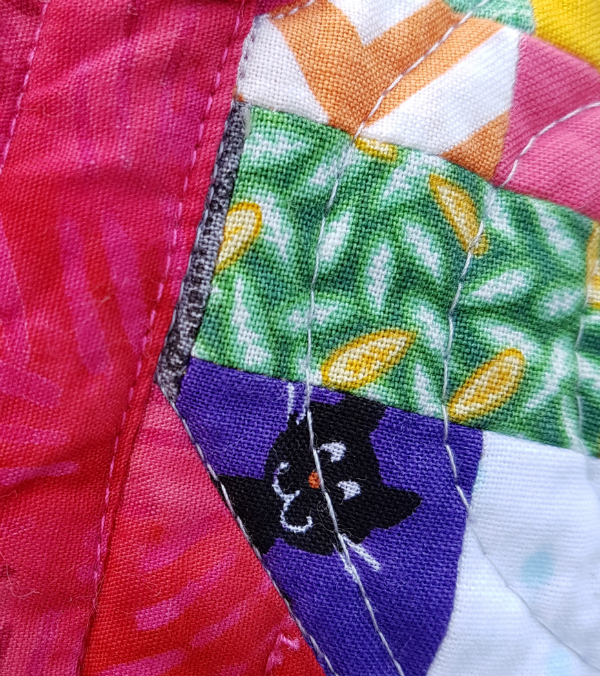 If you didn't see that email, you can contact me at devotedquilter at gmail dot com (using the same email address you have subscribed with) and I'll send it to you again. And if you're not yet subscribed, but you'd like to be, just click here 😊 I'd love to have you! Lastly, Blogger seems to be having problems with sending comment notifications, which may or may not be related to the GDPR regulation as well. That means I'm not getting emails about each comment and I can't easily reply to those comments. So if you comment on this post, or if you have commented on my blog in the past week and you don't get a reply from me, it's not because I'm ignoring you. I am still reading and appreciating every comment and I'm really hoping Blogger will get it straightened out quickly. Technology is wonderful, when it works, am I right? I love how your version of Murrina finished, Leanne! It was such a treat to know we were sewing the same pattern at the same time. I think that the pink batik is stunning for the background and some of your pieces are very, very tiny. The scrappy binding was a great choice, and how ironic that the two joining fabrics were both black with white dots! 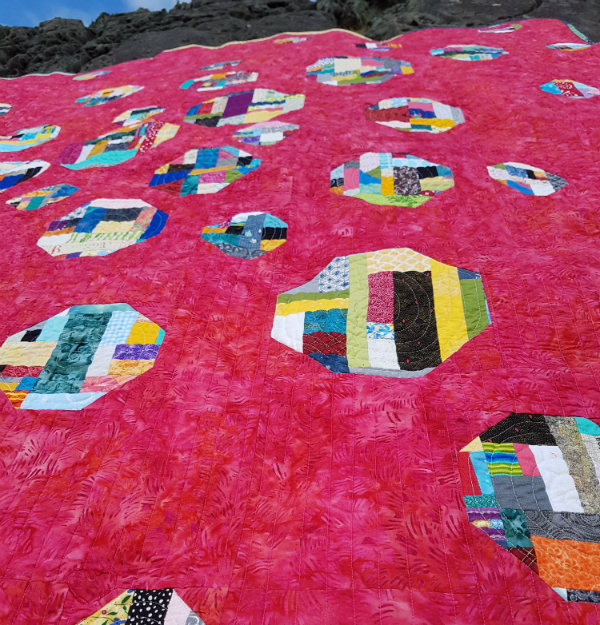 Your quilt makes me think of bubbles floating on the breeze! Congratulations on another great finish Leanne I really like the scrappy binding it was the perfect finishing touch. Super background fabric even if chosen by accident. Love your version of the quilt. What a fantastic "mistake", I love your pink batik background! I had a thought on your tear...once I was marking some lines and I slid my ruler so I could continue the line and the corner of the ruler got caught on the fabric. Maybe that's the cause of the tear? Quick thinking on your part to make a great fix! It's a stunning quilt Leanne and I think the pink is awesome. Also as Yvonne's quilt is blue it's nicer for the hop to have a different colour to see. It's a beautiful beautiful finish. The back ground worked out perfectly! It does look like a complicated quilt design...and I love that it isn't! LOVE your heart fix....very clever! 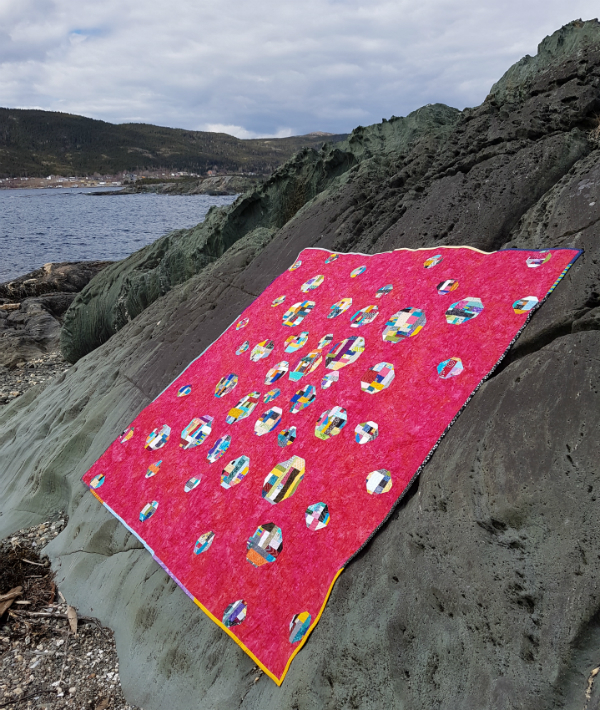 Your Murrina quilt is just gorgeous, Leanne! 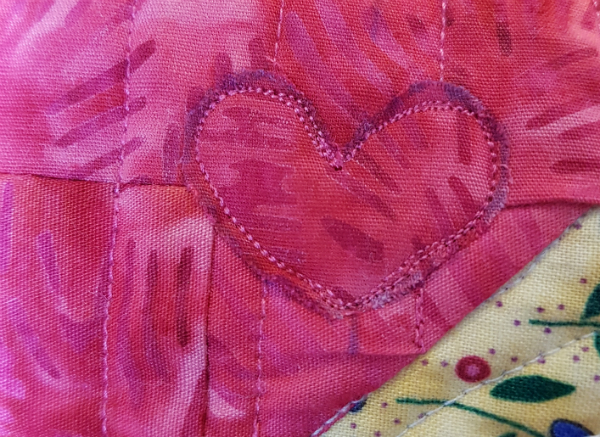 That pink batik is just perfect in the background (and what a clever fix with the heart), and I am so happy you found the pattern to be as easy as I promised. Thank you so much for participating in the blog tour and helping me launch my book. This verson of Murrina is so much fun. Love the way you dealt with your problems, and seeing those little pieces is quite fun! 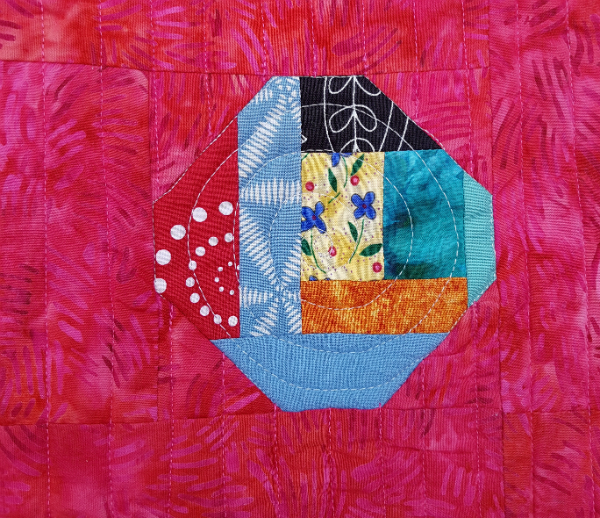 Your quilt is beautiful with the red background and that is one of my favorite Island Batik fabrics! 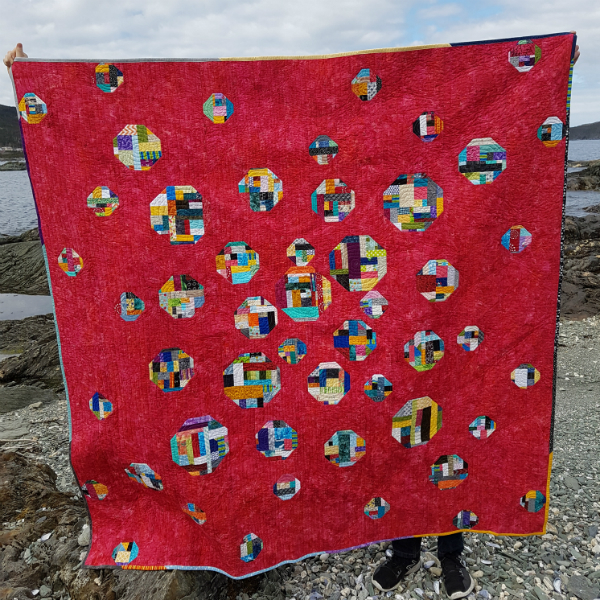 Fabulous way to fix an quilt anomaly! A beautiful quilt, Leanne. I love the story about the background fabric...I thought I was the only one who made mistakes like that!! I like that you showed so great closeups. I have the book and man, do I have scraps! So I guess I need to pick a pattern and get started. Love this ❤️❤️❤️❤️ It’s bright and happy looking. Great job. It brings a smile to my face. such a beautiful quilt, you may have gotten the "wrong" fabric, but if that is wrong I wouldn't want to be right. Wow, you saved this quilt a couple of times or maybe it saved you. Either way, it's one fabulous save! Fantastic finish! I really like this quilt. All the scraps are accentuated by your design. 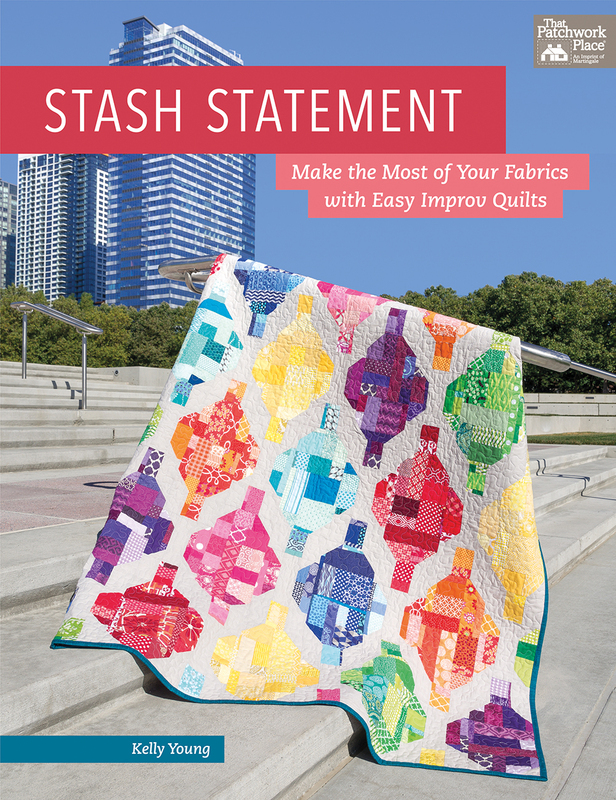 I admire your even straight quilting, too. The scrap binding is the creme de la creme. This is so colorful and it’s beautiful! What an awesome quilt. Love the scraps with the red background.